(Phys.org)—Researchers in the Netherlands have devised a means to use the attenuation that results with radio signals when rain falls between cellular towers, to measure the amount of rain that falls in an area. 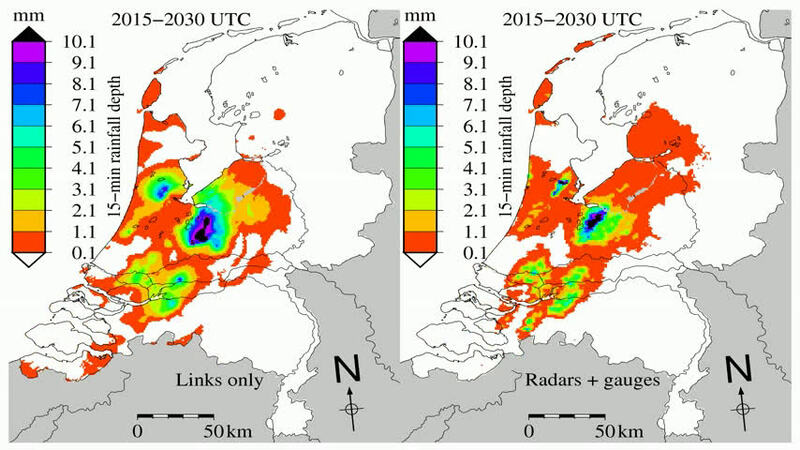 In their paper published in Proceedings of the National Academy of Sciences, the team describes how they were able to use cell phone tower data to create an accurate map of rainfall across the Netherlands twice over 12 day periods in 2011. Cell phone carriers routinely monitor signal strength between towers to ensure network integrity and scientists have known since 2006 that such data could be used to monitor rainfall in a given area. In this new study, the team borrowed data from T-Mobile NL (2400 total links measured at 15 minute intervals over 12 day periods) to create maps that show actual rainfall amounts across the entire country. When rain falls, the drops both absorb and scatter phone signals beamed between towers causing lowered signal strength – a phenomenon known as attenuation. By taking note of the degree of attenuation between towers across an entire network, and then using mathematical equations to calculate the amount of rainfall that caused the loss in signal strength, the researchers were able to create rainfall maps that were nearly as accurate as those created using traditional methods. Rainfall maps are becoming increasingly important as climate change causes some parts of the globe to experience more rain, and others less. To help plan for the future, accurate gauges are needed to help assess short term impact, e.g. flooding, and to predict long term changes such as threats to farming communities. Unfortunately, those who study such data are finding it harder to do so as the number of rain collecting stations worldwide is decreasing. Cellular networks may help – by their very nature they provide far more data points – at least in heavily populated areas and no changes or upgrades would have to be made to a network to begin using them as rainfall gauges. All that would be needed to begin making rainfall maps would be agreements between cell carriers and scientists that work in areas where such maps are needed, e.g. Africa, South America, etc. The researchers next plan to harvest data that covers longer periods of time with a goal of creating annual rainfall maps, which they say could help improve weather forecasting. Accurate and timely surface precipitation measurements are crucial for water resources management, agriculture, weather prediction, climate research, as well as ground validation of satellite-based precipitation estimates. However, the majority of the land surface of the earth lacks such data, and in many parts of the world the density of surface precipitation gauging networks is even rapidly declining. This development can potentially be counteracted by using received signal level data from the enormous number of microwave links used worldwide in commercial cellular communication networks. Along such links, radio signals propagate from a transmitting antenna at one base station to a receiving antenna at another base station. Rain-induced attenuation and, subsequently, path-averaged rainfall intensity can be retrieved from the signal's attenuation between transmitter and receiver. Here, we show how one such a network can be used to retrieve the space–time dynamics of rainfall for an entire country (The Netherlands, ∼35,500 km2), based on an unprecedented number of links (∼2,400) and a rainfall retrieval algorithm that can be applied in real time. This demonstrates the potential of such networks for real-time rainfall monitoring, in particular in those parts of the world where networks of dedicated ground-based rainfall sensors are often virtually absent. Heh. Quite an innovative idea. It's along the lines of tracking stealth craft by the drop in signal strength between towers which was demonstrated a number of years ago.